The Andromedans make me mad. They make me want to get to the next jump gate, board a flight and knock heads. I was left gasping, my tongue out at the edge of the cliff askance at the abrupt end of 312 pages of heat, anger, agony and anxiety. It took a while before it sunk in that it was a story. It had come to an abrupt end. Now I know the meaning of cliff hanger! I am trying to uncurl my fingers, my muscles, and my mind. The Andromedans, the third in the Empire series holds you by the throat from page one and you are taken through at such a blistering pace, into the world of sci-fi and held by the throat until like Adrian you are left denuded of all emotions. At the end of the story I was left begging for more, angry with Elizabeth Lang for not finishing the darn book! I love Adrian Stannis, I even suspected if he was real I would have had a crush on him, and always imagined his reaction that if ever learnt that he would clip my wrinkled ears. That thought makes me smile at the power of the author in making such characters so rounded and compelling. There is however the portrayal in this particular series of Adrian as an object of admiration, exasperation Kali, I always saw as the saving grace of Adrian, her cool understanding of the human race or shall I say in her understanding of us. But there is the new revelation of learning she thinks us noisy. Wow. Ergh, excuse me Kali, was wondering if you were not a mite interested in Sester. Sester, who for me was a non person, annoying, frightening, and downright carries a label.”HANDLE WITH CARE” Just for a nanosecond, he was believable when he fell in love with Rena Dastrin, spring and dead winter affair. Elizabeth is one of my favourite authors, I always read with awe her ability to make fiction so real as for you to think she was reporting a real event that just happened in the neighbourhood. I would like to congratulate her on this one. It is a vast improvement on the series. I do have some questions though. First of all, thank you for your kind words. I’m glad you liked the story. 1. The death of Venner seems tame considering his omnipotence in the Empire, is it to show the supremacy of the Andromedans? It’s hard to answer that without giving away spoilers for the next book. Let’s just say that there will be a fourth and final book to the Empire series called The Vitarins. 2. Who actually is Sester? One senses there is much more to him . There is certainly much more to Sester than meets the eye and we will be finding a lot more about him in the next book. In many ways, his life is, and always has been intertwined with Adrian and Argus. 3. Adrian showed almost the invincibility of the human spirit, but you seem to state in the way that the story has ended that , courage, loyalty and conviction though good qualities of the human psyche, may not win out as evil may ultimately win out. True? I’m glad to say that while evil may take us to some very dark places, it will not, at least in my books, never entirely win out. In some ways, while the breaking of Adrian was horrible, it did have some benefits, although it may not seem like it. When the empire took Adrian as a child and moulded him into what they wanted him to be, he was never allowed to become who he could have been. What happens to him in The Andromedans, allows him to do that and we discover who Adrian is and always has been beneath that cold exterior. 4. The ultimate soldier Argus is proven at the end not to be a human being but an admixture of experiment and engineering, do you feel that the human being is too faulty? The empire thinks that being human is not enough to fight the war and win so they try to ‘improve’ the original, making Adrian super smart but devoid of emotions and Argus a super soldier without a conscience, but in the end, what makes them strong is not these ‘enhancements’ but those characteristics which make them human, their capacity to love and their loyalty. 5. I have an anxious question, will Adrian be redeemed as a human being? In this book we finally get to see the enemy, and while they may look different and have superior technology, their motivations are not unlike our own. I was inspired by an idea from a scientist (unfortunately, I don’t remember the person’s name) that aliens, if they existed and were more advanced than we are, that if they discovered our existence and saw what we have done to our own planet, they might think us a threat that they would not want to allow into the rest of the universe. That idea made me think of other things too, not just how we have used and abused our own world, but each other. 7. Kali as a protagonist for good has been ineffectual, preoccupied with Adrian could not use her potential gifts, did not save Adrian. Tell us why? Kali has always been afraid of her own powers. She doesn’t want to make mistakes because she knows how much damage she can do. In some ways, she has always been afraid of herself, that darkness that makes her willing to do anything, justify any action as long as she feels there is a need. In any ways, she is a microcosm for the compromises that both the Empire and the Andromedans make in order to survive and do, what they think, is the right thing. 8. There is a dead hero Dain, a tantalizing Celia, and a Sam, in different formats, unfinished stories and mysteries to be explored, are you planning on unveiling them later? We will find out a little more about Celia and Sam. As for Dain, as we get to know Argus, it is almost like knowing Dain because they are mirror images of each other. The humanity which made Dain strong enough to break the Empire conditioning is the same humanity that Argus is discovering, albeit reluctantly, about himself. 9. What is your next work in progress? I am working on the fourth book, The Vitarans, and a new sci-fi/fantasy called Mrs. Beeston. 10. You are a very talented artist, and that is a gentler creativity, do you have conflicts of creativity sometimes? I enjoy the different aspects of creativity, both in word and visual. The conflict comes when I never seem to have enough time for both. 11. The author sometimes mirrors himself/herself in one of the characters, which character speaks for you sometimes? They all reflect different aspects of myself, except Sester. I don’t know where he comes from…though I do have a wacky sense of the ridiculous sometimes. 12. Which age will you recommend should read this book? With the sophistication kids are exposed to these days, I would say at least young adult. Thank you for allowing me to share the Empire universe. . When I got about reading this book, I was genuinely skeptical, first saw it as a labour of love for fellow authors. You know in my fondest dreams I used to imagine myself as an author. Now I don’t know anything about donuts and coffee. I love drinking coffee, the processed stuff and donuts? I am generally not into Food or stuff like that, the reason is simple, I live in a part of the world where such things as donuts and coffee looks exotic. Trusting Christine on this I opened the first page and started reading. I must sound a note of warning here. Authors are required to write on what they know, Paula scored that, however if I stayed with the title, I would drop the book. So it might be something worth considering when you pick a title that sends a picture of being a cookery book. Maybe authors should consider a chat with the publisher. This book on a bookshelf in my world will go unnoticed except for the very curious and yes truly is the coffee and donuts of life. 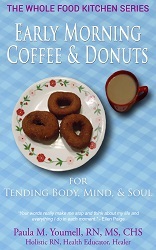 Coffee and Donuts is really hand book that gets you through the day in a wholesome way. I enjoyed myself, and like the author says it is a book you want to read as you get ready for the day. I found myself smiling especially when she insisted I was responsible for my experiences, I love that. She made me believe in her comments, was honest and believable particular when she talked about her fixation with weight and food. I learnt I could forgive myself. That was a cool feeling, to shrug off the weight of guilt and truly accept me, warts and all. Yeah, I could sleep on the darn bed unmade! 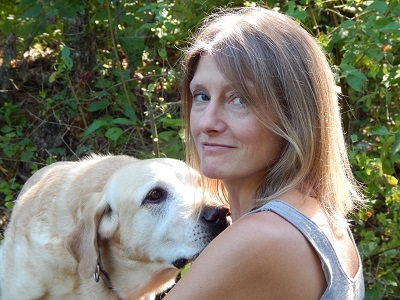 I am a Registered Nurse, Health and Physical Education Teacher, and a Holistic Healer. I have studied whole food nutrition and natural healing for 28 years. I support others on their path to healing their bodies by working in rhythm with nature. 2. Well I got my peeve out of the way, will you like to let us know why you called it coffee and donuts? In the very beginning of the book I explain how people like things, foods, that bring back fond memories and create comfort for themselves. Coffee is a morning ritual that is comforting to many, many people around the globe. Donuts, as I wrote in the beginning of the book, are a fond memory for me. My Sisters and I made many a donut with our Gram. People, in the USA, put coffee and donuts together every morning as breakfast food. The two, paired together, seemed like a heart-warming title for morning inspirations; much like the morning cup of coffee and a donut. 3. From my own spiritual background, I am taught not to see the human being as a divine being, and I find that a hard chew for me, will it matter if a portion of your potential readers think like me? Maybe, maybe not. My life experiences have taught me that the divine, “God -Goddess,” is part of us all, that we were made in the likeness of “God-Goddess;” that our soul is a part of the collective soul, the divine energy of the universe. I too believe healing and spiritual beliefs are not an issue of religion. I think whatever a person’s spiritual beliefs, we can all do deep soul searching to heal ourselves. Your book presumes that I have read your first book, that left gaps because it segregated from truly relaxing as it indicated I need to have read book one. Was that deliberate sales style? No, not a deliberate sales pitch. So many reviews of books on Amazon complain that a subsequent book by the same author were a waste of money as half or more of the information was the same as a previous book. I did not want to repeat information for my readers. 4. I like your comment, ”healing is a journey” and like you stated human beings find that difficult, why do we have it so difficult to start on that journey? I believe for each person there are different factors that hold them back but that all stem from the fear of change, the fear of stepping out of their comfort zone into the unknown and the unknown consequences of this action of change. 5. Let’s go to Nepal, two basic contrasts, the four month old baby and the 102 year old man, the dramatic similarity is that they are survivors of the earthquake, there is a lot of symbolism in that happening. People were affected by that happening, how do we learn to be healed, mind, soul? Natural disasters open a whole different world of suffering. As humans, we cannot control what natural weather patterns (obviously human’s modern industrialized existence is having major impacts on our weather system) and earth shifts bring to our daily life. I think any natural phenomena that has the power to take our loved ones and neighbors from our daily existence is deep form of acceptance, recognizing we cannot control everything that happens to us and in our lives. Perhaps this is what the Buddha meant by letting go of our attachments to things. 6. Please explain to us from this side of the pond, whole foods and our perception that civilization means eating the kind of people (food?) Western people eat. Our main diet is more often carbo- heavy? Whole foods are foods that are minimally processed, cooking and cutting up food is processing, and nothing is removed from the original food and nothing has been added in. For example, refined flour takes the whole grain and polishes off the bran and germ (removing parts of the original whole). This leaves the grain’s endosperm only to be ground into flour. You have lost the fiber source (bran), the fat soluble nutrients (germ), and many minerals and nutrients. On the adding in side of things, let’s take a look at most commercial yogurt. Yogurt is simply cultured milk. Commercial yogurt adds thickeners, stabilizers, refined sugars, and in some cases (cheap brand names) artificial flavors. Are your Carb heavy diets from whole food carbohydrates; not the refined, packaged food carbohydrates of American culture? 7. How would you want your book to be assimilated by the average African who has lived all his life on the continent? This is an interesting question as books definitely have an audience range. I do not have any preconceived notions that my book will appeal to all audiences from all walks of life. Industrialized nations, whose people have pulled themselves away from the flow and rhythm of natural living, need to be reminded that we are all a part of nature, all a part of the web of life. 8. Please explain what you mean by holistic healing, do you accept herbs and the use of incantations in place of yoga? Holistic Healing means using natural means to re-balance the body’s health: herbs, whole foods, energy healing, daily movement, natural lifestyle choices, etc. 9. Do you write only on healing, will you accept clients from Africa? Do you have a regular clinic and is it very expensive? I would accept any client who wants to work with me if we both agree that my support services are a good fit for the person needing support. I also need to feel comfortable in my ability to help the person. If I think someone else might be better suited, have more knowledge and experience with their challenges, I would not hesitate to refer them to someone else. I have regular office hours and I do not believe I am expensive. An initial consult is $175 and a person is hiring me for at least 8 hours of my time to review their health history, start a map of their healing plan, meet with them for 2-3 hours, then I do a thorough email follow up with suggested lifestyle changes and healing additions to their lives, and answer email questions for 2 full weeks. •	Do laundry, clean house, get in a bit of yoga, etc. •	Write books, blog posts, articles for magazines, etc. •	Pick my kids up at 2 PM. •	Make dinner, do dishes, and finish up any business work. •	Bed by 9:30, read, lights out by 10 PM or so. •	It is a fun life! 11. What is next after coffee and donuts? 10 years ago I started a book about working with kids around whole foods, health, and healing. It was a homeschool project with my 2 sons. I would like to finish this book. I also have ideas for 5 or 6 more books. It is a matter of having the time to write. 12. Please give links to where we might purchase your books and blog you have. Thank you very much for being part of this discussion. Thanks so much for the opportunity to share my work and passions with your readers. I used to wonder about the civilized world. Wondering bemused into a virtual world and you wonder at the value system. Don’t get me wrong, I like a lot of what I have seen. You know there are times when you suspect that your uncomprehending look at some of the things could be the reason you wonder if you would ever get the hang of the civilized world. They saved us from ourselves and showed us how to help each other yes? Okay, I could buy into that, but I am completely puzzled by our greed for the trivial, the mundane. It is like this, for quite a while I read and watched the hype to the fight of the century as it was dubbed between Floyd Mayweather and The Filipino congressman, Manny. Can’t get the spelling right, so I don’t want to disrespect him. Manny caught my interest because I saw him as a man using his fists to help his people. Floyd on the other hand leaves me worried. There is hype about how Floyd uses his money to help his friends and I hope complete strangers. The world however seemed to have received two riddles at the same time. Like in those Greek times, humanity was asked a question and I am not sure we heard the question let alone if we took time to answer it well. At about the same time, Nature struck and slapped an Earthquake on us via Nepal. I watched fairly numbed as the death toll escalated and then as some kind of comedy relief, the supposed fight of the century. Floyd made another hundred million dollars and would probably pick up another rolls Royce, or whatever other toy. Those in his magic circle would probably get something too. A four month old baby survived the earthquake but would take his chances with the health and living standards of Nepal, it is not really Floyd’s problem. Heck he earned his dollars trying to bash Manny’s common sense out of him. These two gentlemen were egged on by others who paid hundreds of thousands of dollars to watch the supposed gentlemen beat sense out of each other. I have never understood the rationale for justified violence. I never did comprehend the sport of wrestling and boxing and have always wondered at its rationale. Okay, we have African wrestling but my confusion is still the same. Why don’t we have a sport that help a fellow human being? Sometimes in our dim past, we took interest in helping each other. There is a saying by our elders in my corner of the world, and it states very simply, that for as long as there is a poor unfortunate person in your family, the rich man can never lay claim to being truly rich, for he is the sore finger in your hand. One sore finger is the discomfort that keeps you awake. By the same token, for as long as there is a desperate country in the world, the rich countries and their economy stand threatened. Human beings exist on the understanding of the fundamental rights and would therefore not heed imaginary boundaries and seek haven anywhere they can find it. That is why Italy and Europe is swamped by boatloads of desperation on daily basis. They drown, get sick, get shot but the tiny sliver of hope that they may survive, keeps them trying. Maybe it is time, the rich nations start looking at that, hope. Every human being was born screaming for his own share of oxygen to stay alive, his own space, his own sun, and is programmed to search for the rationale of his existence, pushed to fulfill his definition of himself. Failure is a smell he does not want around him. No man known in history has ever had life mission to fail. Not the four month old baby pulled from the rubble of Nepal. Interestingly, the 101 year old man who made it out of that rubble was glad to be alive. He would like to stay alive as long as he can. What is my point in all this?, just hoping somewhere that Floyd might postpone another Rolls Royce, and give a thought to that four month old baby. The cost of one RR, could change several lives. Might give a rationale to the official fisticuffs he enjoys. Money and muscle should be balanced by common sense and a common understanding that we all are connected one way or the other.